James DeGale's pair of early knockdowns held up on the scorecards and he notched an unanimous decision over Andre Dirrell to win the vacant super middleweight title. James DeGale may not have had the speed or athleticism to match Andre Dirrell on Saturday in their vacant super middleweight title bout. But the native of England had the power, and his pair of early knockdowns held up on the scorecards in a close fight. After dropping Dirrell twice in Round 2, a fatigued DeGale held off a late rally to score a unanimous decision (114-112 twice, 117-109) in a Premier Boxing Champions series card from Boston University's Agganis Arena. ESPN.com also scored the bout 114-112 for DeGale. "I'm speechless. My whole career, what I have been building up to is winning a world title and I've finally done it," DeGale said. "I'm world champ. I'm world champ. I made history as the first British Olympic gold medalist to be a world champion." 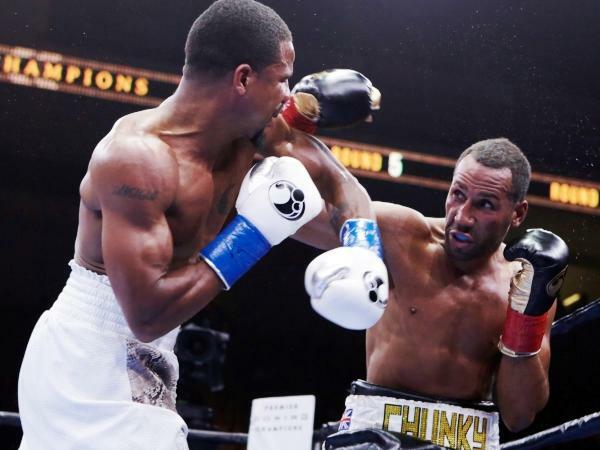 In many ways it was a tale of two halves as DeGale (21-1, 14 KOs), a native of London who won gold at the 2008 Beijing Olympics, faded late and appeared to give away rounds due to a lack of activity. Despite the two southpaws spending most of the contest trash talking at an audible level, they embraced after the final bell. "I told him you are a true champion and a skillful fighter and that I respect him," DeGale said. "He's a very good and skilled opponent. I knew I was in for a hard fight. I knew it. But I was ready." Utilizing his awkward, crouching style, DeGale, 29, lowered the output of Dirrell's punches in the early rounds by routinely tagging him with hard shots. After DeGale was cut over his right eye early in Round 2, he caught Dirrell flush with a looping left hand to drop him hard to the canvas. DeGale swarmed in to floor Dirrell a second time later in the round after mauling him with combinations along the ropes. Bleeding from his mouth and nose, Dirrell (24-2, 16 KOs), 31, looked shaken defensively and struggled to pick up DeGale's timing as the rounds progressed. It was the mercurial 2004 Olympic silver medalist's first fight of this magnitude in over five years due to injuries and problems with his management and promoters. But Dirrell, a native of Flint, Michigan, rallied to rebuild his confidence after a rough start and was the busier fighter between Rounds 6 through 10, backing DeGale up to the ropes with clean left hands. DeGale explained his lack of intensity late in the fight, saying, "I was just feeling my way through. Listen, let's not forget, he's a very good opponent. He's an Olympic medalist and hard to beat." With the fight up for grabs entering the final two rounds, DeGale stepped up his activity level to seal a close victory. "I used my speed and footwork," DeGale said. "I was coming in and out and going over the top. I'm back now. I'm injury free and I will take on any super middleweight in the world. "I'm hard to beat. When I'm at my best, I'm hard to beat. There's no other super middleweight that would beat me." In the co-main event, light heavyweight Edwin Rodriguez, of nearby Worcester, Massachusetts, gave local fans something to cheer about by punishing Craig Baker in a third-round TKO. Rodriguez, 30, started fast and continued to hurt Baker, 31, of Baytown, Texas. In Round 3, Rodriguez (26-1, 17 KOs) rocked Baker with powerful right hands along the ropes until referee Bob Benoit stepped in to stop the fight at 2:22. "I imposed my will and took him out," Rodriguez said. "I was hitting him with some hard rights and it was just a matter of time. I hit him with a lot of clean rights but I really wanted to knock him out." The victory was the third straight for Rodriguez since his first defeat against super middleweight champion Andre Ward in 2013. "I'm ready for a title fight now, Adonis Stevenson or Sergey Kovalev," Rodriguez said. "Maybe it would take one more fight, but I leave that to adviser Al Haymon and promoter Lou DiBella." Welterweight Danny O'Connor (26-2, 10 KOs) dominated overmatched Chris Gilbert (13-2, 10 KOs), who took the fight on one week's notice. O'Connor, 30, of Framingham, Massachusetts, saw his May 29 bout with Paulie Malignaggi fall apart after Malignaggi was cut in sparring. But he controlled Gilbert throughout, dropping the native of Windsor, Vermont, five times in a fifth-round TKO. Utilizing counter left hands to routinely catch Gilbert coming forward, O'Connor also scored two knockdowns on hard hooks to the body, with the second one bringing an end to the fight at 1:44 of Round 5. "He used his brute, but I used my brain," O'Connor said. "I boxed intelligently and I stayed true to me. I was smart." Middleweight Gary "Spike" O'Sullivan of Cork, Ireland, scored a second-round knockout over Melvin Betancourt of the Dominican Republic. O'Sullivan (20-1, 13 KOs) sent Betancourt (29-1, 23 KOs) to the canvas with a right hook to the head in Round 2 and dropped him again with a left hook to finish him off. Light heavyweight Edwin Espinal dominated Alvaro Enriquez to score a five-round unanimous decision. Espinal (6-0, 5 KOs) a power puncher from Providence, Rhode Island, dropped Enriquez of Mexico (5-14-2, 1 KO) in the third round and manhandled him in the fourth for the easy win. Junior lightweight Ryan Kielczewski of Quincy, Massachusetts, rebounded from the first loss of his career last month to stop overmatched Anthony Napunyi in the first round. The end came following a Kielczewski left hook to the body. Napunyi went to one knee in his corner and was counted out at 2:24 of Round 1. Welterweight Logan McGuinness (23-0-1, 10 KOs) of Ontario, Canada, got dropped in the first round with a jab to the chin but recovered to defeat Gerardo Cuevas (17-14, 15 KOs) of Mexico by unanimous decision (57-56 on all three scorecards). Information from ESPN.com's Andres Ferrari contributed to this report.